Brother Paul Quenon, a passionate poet and photographer who melds the solitude of being a Trappist monk with universal spirituality, will be sharing his wisdom and gentle wit on Wednesday, March 2 at 7:30 p.m. and Thursday, March 3 at 10 a.m. and 2 p.m. as guest speaker for the Theo and Belle Moll Lecture series. Quenon, who has lived as a Trappist monk at the Catholic Abbey of Gethsemani in Kentucky for 50 years, was trained under Thomas Merton, an acclaimed 20th century social activist, poet and author whose brilliant writings have been revered worldwide. Accomplished in his own right for being a talented writer who weaves emotion, vivid imagery and spirituality into his poetry and books, Quenon is a powerful presenter whose quiet presence and universal wisdom speaks to the soul. His book "Monkswear" includes simple yet profound images of monastic life portrayed through poetry and photography. His work incorporates humor, reflective passages and personal accounts that inspire readers to step out of the modern world and into one of gentle beauty. On March 2, 7:30 p.m., Quenon will speak on “Prayer as Poetry and Play” in the Lindsay-Crossman Chapel, 56 Seminary St. On March 3, 10 a.m., he will address ”Listening in a Monastery: Poetry of the Moment” at the same location. A panel discussion featuring Quenon will be held at 2 p.m. on March 3 in the Strosacker College Union (Sandstone 3), 120 E. Grand St. These events are free and open to the public. The Moll Chair in Faith and Life was established in memory of Theo and Belle Moll to nourish spiritual life at Baldwin-Wallace College and beyond. Each year the chair sponsors a series of programs with guest speakers who address topics of faith and spirituality pertinent to today’s world. The current chair holder is B-W Professor of Religion Dr. Alan Kolp. This year's theme is "In Praise of the Useless Life." Theo Moll was the founder and director of MTD Products Inc. Moll was first elected to the Baldwin-Wallace Board of Trustees in 1965 and served as vice chairman of the Board for many years. In 1973 Baldwin-Wallace awarded Theo Moll the honorary degree of Doctor of Humane Letters not only for his commitment to the College, but also for his leadership and dedication to the larger world of business and industry and his devotion to family and church. For more information, please call 440-826-2325. I want say a couple things in the beginning this post and that it can be as much of a discussion or “thread” as anyone who reads it really wants it to be, or believe it is, can be. I recently came across the Ohio City Writers online and began looking into the details of the newly formed organization out of insatiable curiosity. I want to direct people who may not be aware of this newly forming non-profit to its now presence, as well as to my own personal philosophies on volunteerism, social enrichment and Cleveland’s kids. Some unknowns about myself to anyone reading: I am young, or younger than most as I‘d like to think. I am not wise and certainly not the wisest. I am a writer. I have volunteered multiple times through the Ohio A.B.L.E. program, tutoring E.S.L. and G.E.D. students in multiple subjects. I have supported 826 National for years now and got to know about the organization just through being a fan of Dave Eggers‘ fiction work. He is an amazing person, a good writer, but an amazing person. And one I’ve yet to meet. I’ve also corresponded with the 826 non-profit before about their structure, their workshops held in California as basis for city bidding, opening new hubs throughout the country, and methods. I’ve visited the nearby Ann Arbor site and even donated to 826 Washington, D. C. while at the recent AWP conference. And I truly believe children and teens need centers like this globally. A question I have in its design that I wanted to write about on the blog as well as talk about with other Cleveland writers, hoping some of you who read this are not only involved with the formation of the organization, but can promote and describe better what this center is supposed to become. How accessible is the center going to be to youth in Cleveland that need this kind of tutoring? Any Clevelander can tell you, Ohio City is one of the trendiest spots in the city: it has a very budding arts network, fast-paced and competitive restaurant and tourist growth, and historical value to the city of Cleveland, but how relevant is this center really going to be or have an impact on Cleveland's kids, especially those that need it? Is Ohio City Writers making trend more trendy here, or turning education volunteer programming into trend? I’d like to think the answer is both and believe it is. There are a lot of parts to Cleveland. I only bring up this subject because I believe so heavily in this kind of work, in its application in a society and the development and enrichment of other people. But I also really believe a discussion and exposure on the topic (and center) can only lead to the best in my own personal perception and questions on volunteering, on Cleveland, and on the understanding of what this non-profit may need, now and in the future, from myself and others. Most of the people involved in this organization are not only Clevelanders, but professional writers. In the end, why would there be such an absence of mention of it from the poetics blog? Deer tracks on the snow. 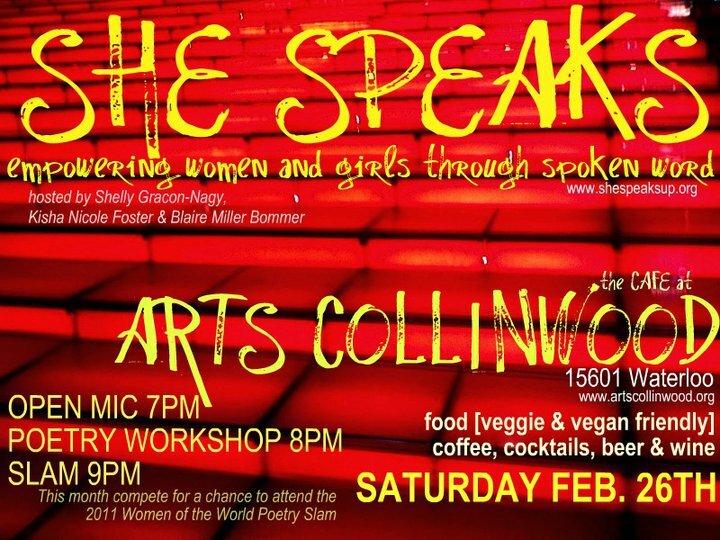 Check out She Speaks at its new location, The Cafe at Arts Collinwood, the fourth Saturday of each month. For more information, please visit www.shespeaksup.org and/or this month's She Speaks event page on Facebook. What else ya gotta do on a Wednesday night? Swing on by Visible Voice in the uber trendy Tremont neighborhood and get yourself workshopped by a pair of live poets. Irish Diva Doc McMahon and poetry prize magnet Professor Lou Suarez guide you through the briar patch that is big time poetry writing. Plus – don’t forget the swell nearby watering holes where you can drink and gossip about the instructors afterwards. C’mon really, what else ya gotta do? Cost: DOUGHnation of 5-10 bucks to go to the LIT. Poetry in the Wood at the Bertrum Woods Branch of the Shaker Library hosted Sammy Greenspan, Robert Miltner and Bonne’ de Blase while this month’s edition of Lix and Kix treated us with Steve Brightman, Wendy Shaffer and Diana Chittester. faith seems a white bed of rising steam. from the day’s sure ossification, the slow boarding of bone. of myself, of only two and not the holy oil-slick one. are by lamplight only shadows. 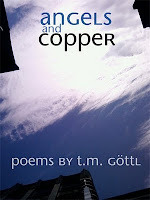 Cleveland Poetics blog contributor T.M Göttl is also a brilliant poet who has a new chapbook available from Cleveland's Blasted Press. Pick up a copy and hear T.M. 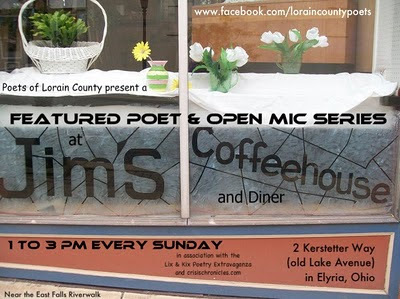 read Sunday February 20th 2011 at 1 p.m. during PoetryElyria at Jim's Coffeehouse and Diner, 2 Kerstetter Way in Elyria, Ohio. 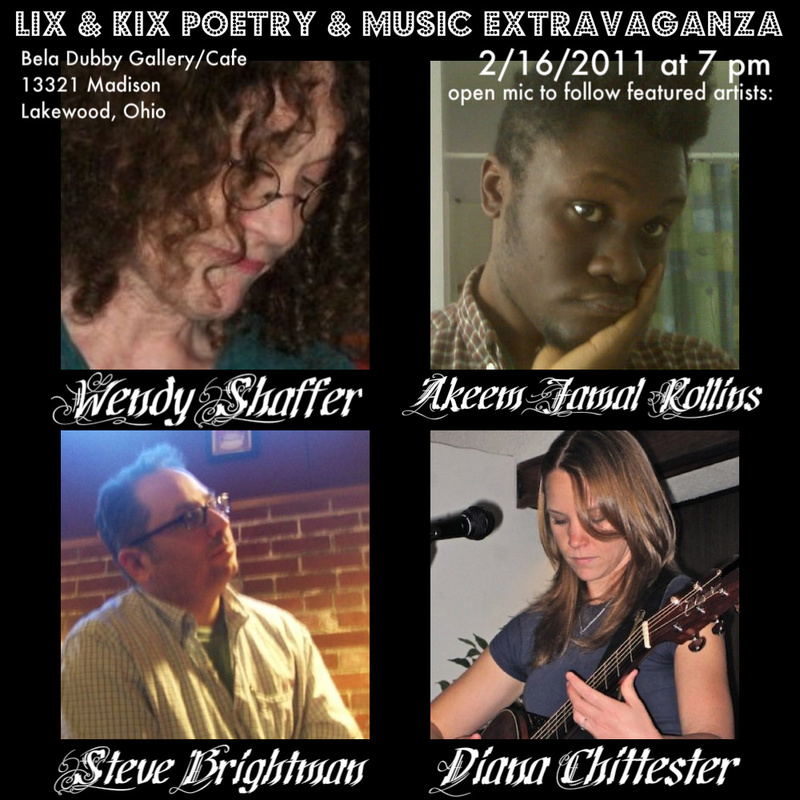 This event will also feature readings by poets Steve Thomas (of Cleveland) and Tina Puckett (of Stark County). An uncensored open mic will precede the features. Visit Blasted Press at www.blastedpress.com and on Facebook. March 6th: Grand finale at Jim's Coffeehouse, featuring John Dorsey (Toledo), Zach Ashley (Detroit), Steve Goldberg (Cleveland) & Steve Brightman (another a Blasted Press author, from Kent). 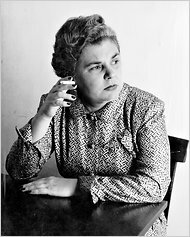 The New York Times has a long article about the letters between poet Elizabeth Bishop and the New Yorker. "A world-class procrastinator and Olympian ditherer, Bishop sometimes didn’t finish a poem for decades." "At times the politeness of poet and magazine seems that of two countries about to go to war — tactful enough with her editors (though she felt that reading the magazine was like “eating a quilt”), in letters to friends Bishop groused about the revisions proposed. 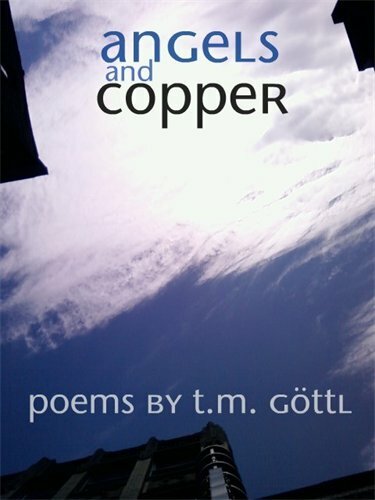 (“They once put 23 commas in a long poem of mine,” she groaned.)" "The New Yorker has suffocated at times beneath a mask of wry gentility. For all its glossy reputation, the magazine still turns up its nose at stories and poems that make too many demands on the reader. It’s a middlebrow journal for people who would like to be highbrows — and perhaps for highbrows who love a little slumming. The cartoons, as Biele notes, provide an antiphonal chorus to the reckless consumerism of the ads." -Ouch! Wonder how many times he's been rejected there? 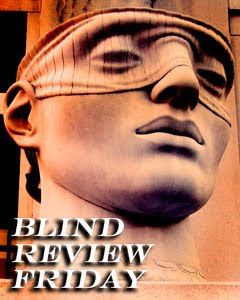 The Winter 2011 issue of Astropoetica is now out. Poets have had a fascination with the stars ever since the beginning, and Astropoetica has been a web 'zine devoted to astronomical and science poetry. With gorgeous pictures, too-- it's as much an art 'zine as a poetry one. Worth checking out. And, if you like science poetry, they also have a nice set of links to other sites about astronomy, poetry, astrophotography and art. The bookseller chain Borders filed for Chapter 11 bankruptcy protection today. This is not unexpected-- they've been teetering on the edge of bankruptcy for quite a while now-- but still it's a blow to the small fraction of the public that actually buys books. Chapter 11 is not quite the same as death; their survival plan is to close 30% of their stores. Still, problems with one of the chain bookstores will not mean a return to the (mostly imaginary) days of small intimate bookstores; it is a oracle sign of the severe problems faced by all bookstores, and when the world has fewer bookstores, it is, in a small way, a less wonderful place. Whatcha doing for Superbowl Sunday? I'm a great fan of Oprah Winfrey, a celebrity who has consistently been on the side of writers, and a strong advocate for reading, Which is why I'm so terribly disappointed to see name associated with a clear grab-- very nearly theft-- of writer's rights. 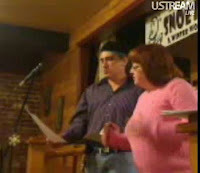 It looks so innocent-- she's asking for poets to submit their poems. How can that be bad? Maybe, just maybe, she'll make them famous. Well, she's taking advantage of the hopes and dreams of gullible writers here. It's a scam. Read the fine print. It says that anything you submit, whether they publish it or not, belongs to them. Submit, and she owns all rights forever! "Harpo shall exclusively own all known or later existing rights to the Submissions worldwide with the unrestricted right to use the Submissions for any purpose in all media now known or hereafter discovered without compensation to the provider of such Submissions." Not merely all rights, forever, but they're even demanding rights that haven't been thought of yet! It's probably not even legal (they're not offering to pay for the rights)-- but don't count on the terms not being enforced. Don't just walk away from this one: run!